So a little while ago I was given the opportunity to read The Nurses by Alexandra Robbins and unfortunately have not made it very far related to all my school work. But what I can tell you is that it is a beautifully written narrative of four real RNs throughout one year. The author Alexandra Robbins is winner of the 2014 John Bartlow Martin Award for Public Interest Magazine Journalism, and author of four New York Times bestsellers, and was voted Goodreads' Best Nonfiction Book of the Year. She has written for the New Yorker, Vanity Fair, The New York Times, and other publications, and has appeared on numerous television shows. The Nurses: A Year of Secrets, Drama, and Miracles with the Heroes of the Hospital follows four nurses in different hospitals throughout the year. In order to write about nurses, Alexandra did an in-depth investigation of hospital culture that included doctors behaving badly, violence in the workplace, nurse bullying, and why nurses are heroes. 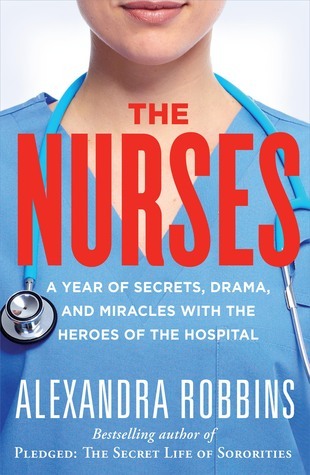 Alexandra Robbins has received advanced praise for the narrative from nurses and nursing students alike. I do not know about you but I cannot wait to finish this book! Stay tuned for my own review of it, too. Enter below to win your free copy of it! A huge thank you to Alexandra Robbins for sponsoring this post! They are heros because they're the first and the last person to see a patient. They are the ones that leave the lasting impact on the patient. You never know how much just one smile can mean to the patient! They are Heros because they truly change patient centered care. Nurses are the first and the last person that a patient sees during their stay. If they make a good impression, the patient will always recognize them. I cannot wait to be an inspiration to someone every day as a nurse and hopefully this book will inspire me to do so! Nurses are heroes because they are the ones who are advocating for YOUR care. They are the backbone of the health care field. I cannot wait to be one.